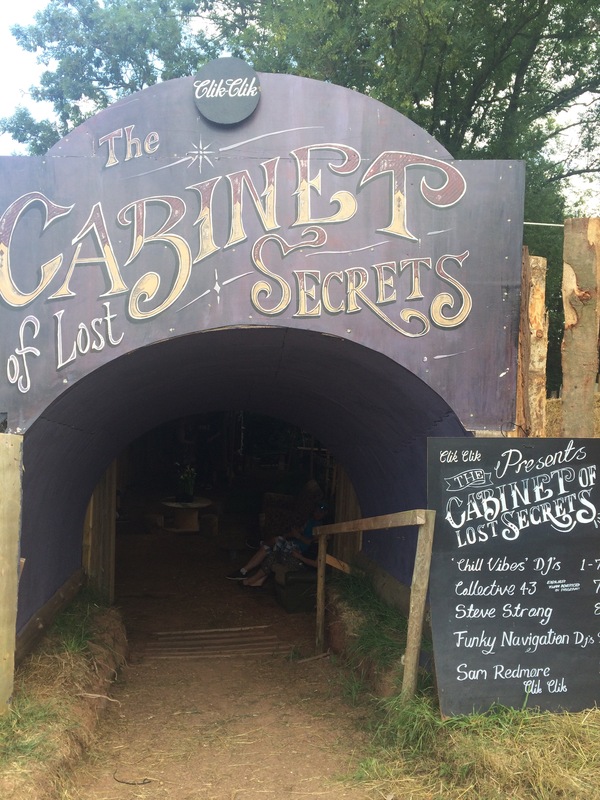 Here is a little recap from one amazing weekend at Nozstock, with the weird and wonderful Cabinet of Lost Secrets. Back for its second year, produced and directed by Clik Clik and created by a team of people all dedicated to making your experience a unique one, the Cabinet excelled itself once again! The Cabinet is no ordinary venue. Its fronted by a cosy seating space, which masks a cavern of secret doors, passages and surprises leading to a live music space. It changes every year. Its playful and interactive, the animals live there and are host, if you can find them. They love a good party! 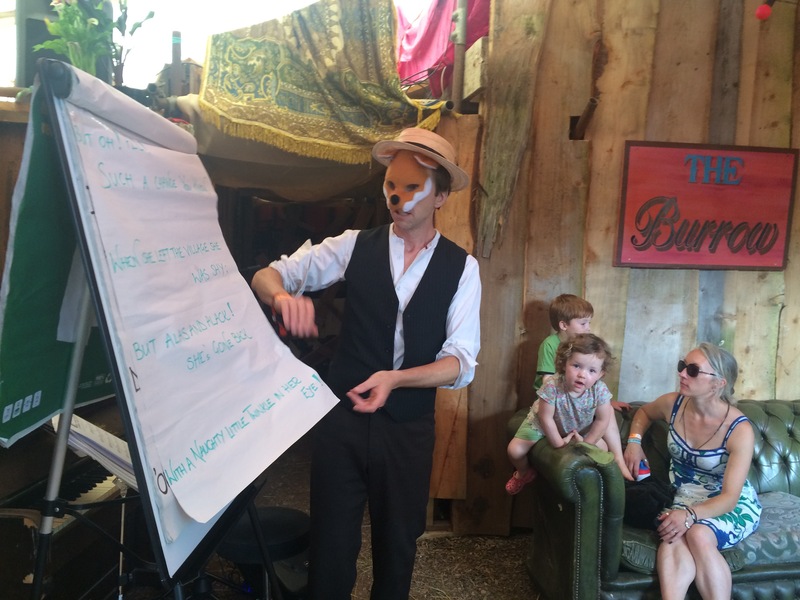 In the daytime, the seated ‘Burrow’ is alive with piano playing, sing songs, arty activities, immersive performers and dj’s. There is a life drawing class taking place in one of the rooms followed by a pop up exhibition of the weekend students work. People creep around the corridoors wondering where to go, but the doors are closed until the evening. The Demon Barbers pop up for some beard trims, cut throats and trims if you dare! Then comes the nightime and the animals wake up. The doors are unlocked and the public try to claw at the walls, find the right way in. Which door will open? Only the animals know the way to the heart of the Cabinet, where the dancing goes on til late! 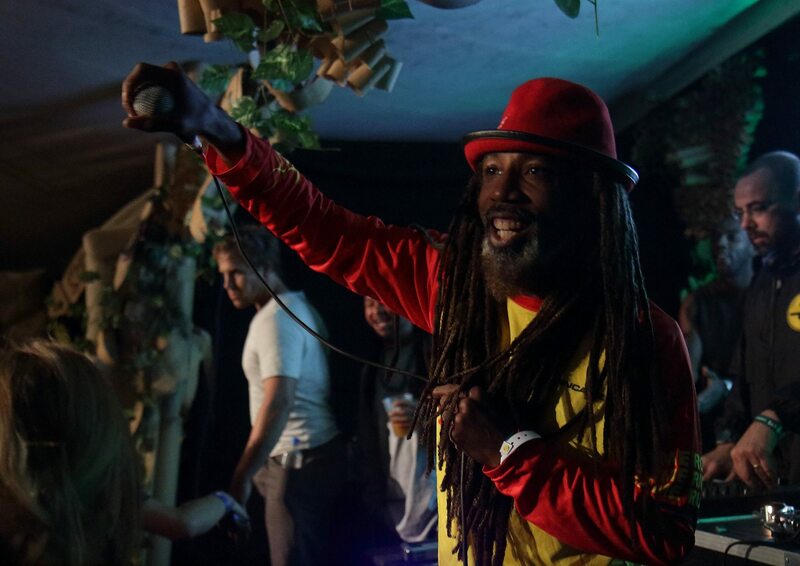 With some stunning performances from bands, DJ’s, artists and performers, the big showstopper was of course the (planned) secret gig from Jurassic 5’s Akil! As word got round the site that late saturday night, the people gathered, only 145 lucky people made it inside for this very intimate close range performance from the legendary Akil and his crew, bringing some hip hopping vibes and audience particpation to the cavern-like hidden venue, an ancient temple ruin created solely from waste materials (apart from some fake ivy!). All guests got to mingle with the special guests afterwards and everyone left happy! Of course there were other blinding shows brought to the Cabinet with live music from Cantaloop, Desert Boots, Seas of Mirth, Calm like a Riot, Steve Strong, The Pink Diamond Revue, Collective 43, Rosebud and a surprise gig from Normanton Street. Taking the decks by storm was the mighty Sam Redmore, the Cabinet resident team Funky Navigation, Brighton based Beatwell and Dante, and a pop up from Bhangra dj Jay Singh. Also popping up were immersive theatre troupe Collective Unconscious and Play it Again Dan.